The Estero Padre Ramos Nature Reserve is located 115 miles (185 kilometers) from Managua, on the Pacific Northwest Coast of Nicaragua. 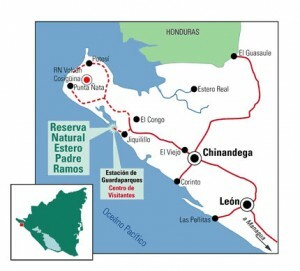 There are many ways to get from Managua to Padre Ramos, depending on your travel plans, budget, and time constraints. Please contact Ibis if you need any advice in planning your trip. Don’t 4get! We arrange transportation for you on all Multi-Day Pacific Coast & Caribbean Tours. Private Transportation: Rent a car at the airport. Or take a taxi from Managua to Leon (Cost ~$50, 1.5 hours). In Leon, arrange private transportation to Padre Ramos (Cost ~$70, 1.5 hours). Please call ahead to make all the arrangements. Public Transportation: Take a taxi from the airport in Managua to UCA, the University of Central America (Cost ~$5). Take a microbus from UCA to Leon (Cost ~$2, 1.5 hours). 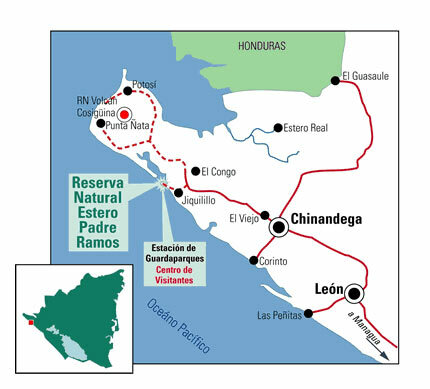 Take a bus or microbus from Leon to Chinandega (Cost $1, ~1.5 hours). In Chinandega, take a bike or taxi from El Bisne bus station to El Mercadito bus station (Cost $0.50-$1). Buses leave from El Mercadito to Padre Ramos at 6:45am, 9:45am, 11:15am, 2:45pm, and 4:15pm (Cost ~$1, 1.5-2 hours).